Enjoy a memorable summer dinner comprised of coastal cuisine and sweeping views of the coast at Surf & Sand Resort’s signature restaurant Splashes. Just steps from the water, among the sounds of California’s rolling surf, Splashes restaurant just debuted a new summer menu created by Chef Ron Fougeray, who is passionate about making everything from scratch and sources the finest possible ingredients including Southern California’s bounty of fresh seafood. 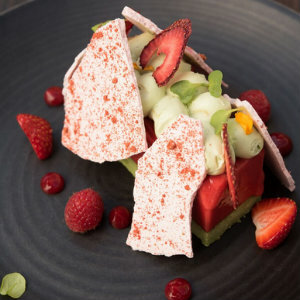 New summer dishes include appetizers such as Hamachi crudo with charred avocado, compressed strawberries, coconut crisps, thai chili and coconut water; and Pork belly with cauliflower puree, purslane, pickled fresno chili, and peach jam. There’s a delicious Heirloom tomato salad with torn burrata, fresh English peas, saffron, hearts of palm, gooseberries, kalamata powder, and basil oil. Entrée dishes include Rack of lamb with tarragon gnocchi, sheep’s milk turmeric yogurt, pickled cauliflower florets, pistachio dust, and mint salsa verde. Seafood specials include the Seared scallops with English pea puree, purple cauliflower florets, pomegranate, butternut squash, and a verjus reduction; as well as the Sauteed sea trout with heirloom beets, carrot and apple puree, black barley, and a light strawberry daikon radish vinaigrette. 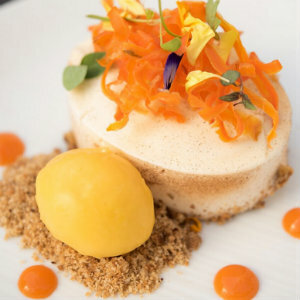 You should definitely save room for dessert, fresh new seasonal desserts include a light rendition on carrot cake, featuring pineapple compote, candied carrots and tropical sorbet; and a strawberry meringue vacherin with pistachio cremeaux. Splashes is open for breakfast, lunch, dinner and brunch. Breakast: 7 a.m. – 11 a.m. Monday to Sunday, 11:30 a.m. – 3 p.m. Monday to Friday, Brunch: 11:30 a.m. – 3 p.m. Saturday and Sunday; Dinner: 5 p.m. to 10 p.m. Sunday – Thursday; 5 p.m. to 11 p.m. Friday and Saturday. 1555 S Coast Hwy, Laguna Beach. 949.376.2779.